Page Parkes Model + Talent: PP's Stylist Also Styles the STARS! PP's Stylist Also Styles the STARS! Ali Kahn, one of our beloved stylists, is so fab!! You know the actress, Mayim Bialik, from your favorite 90's sitcom - Blossom!! She currently stars on The Big Bang Theory, which was just nominated for a SAG Award. 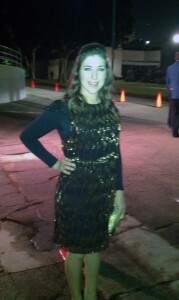 Ali got to style Mayim for the 100th episode party of The Big Bang Theory!! Mayim even wrote a sweet blog about her great experience with Ali's styling. We are so proud!! Here is a photo of Mayim and her outfit for the party!